Jaca is the beautiful capital of a region, the Jacetania, and belongs to the Comunidad Autonoma ("autonomous community") of Aragon, northeastern Spain. Situated in the center of the Pyrenees mountains, on the plateau on the southern bank of the Aragon River, just south of the French border, Jaca is close to the "Ordesa National Park" (the oldest protected natural park in Spain, with a surface area of about 2,200ha.) and several 3000 meters high mountains, like "Monte Perdido". Of ancient origin, the city was captured by the Romans in 194 BC and surrounded by walls, which, with medieval additions, still partly stand. In 716 it was taken by the Moors and, under the name of Dyaka, was one of the principal cities of the region governed from Sarakosta (modern Zaragoza). Retaken by the Christians in 760, Jaca was declared a "city" by King Ramiro I of Aragon (1035-63) and was the first capital of kingdom of Aragon. 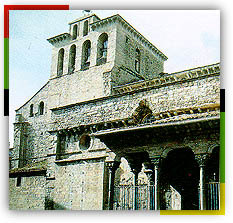 Jaca has notable landmarks that include the 11th-century cathedral; the Citadel (Ciudadela), begun in 1593 and in a state of perfect preservation; and the town hall in Plateresque style (1544). The Torre del Reloj ("Clock Tower") is the permanent site of the Comunidad de Trabajo de los Pirineos, a groupement of three French Regions (Aquitaine, Languedoc-Roussillon et Midi-Pyrenees ), four Spanish Comunidades Autonomas (Aragon, Catalunya, Navarra y Pais Vasco) and the state of Andorra. In odd-numbered years, Jaca holds the International Folklore Festival of the Pyrenees, which takes place around the first week of August. Apart from folklore groups from the French-Spanish Pyrenees and from different Spanish provinces, the most outstanding folklore groups from many countries of the five continents participate, which is why it has been called the Folklore Olympics. In Jaca it is possible to go ice-skating in the Palacio de Hielo. Jaca's economy is based primarily on agricultural trade and tourism. Pop. is around 12,000.